Babies. Children. Kids. Teens. Young Adults. Adults. Senior Citizens. Angels. Growing upwards is great. But, at any given time along the way, who's in charge? Who's really in control of our lives? OK, so you're a teenager now. You're not little kids anymore without any say whatsoever. Yet, you're not adults living on your own, paying rent, buying groceries, doing laundry and fully taking care of business. So being a teen is a weird, in-between place to be. You’re somewhere in the middle. Sometimes, it can feel like The Upside Down. When we're teens, our parents still organize our home lives. They tell us when to go to bed; they wake us up—often harshly and always too early. They get us ready and ship us out the door each morning. Someone else makes our meals and drives us around in THEIR wheels. We come to school to learn, to compete, to perform. Yet our teachers teach us, our coaches coach us, our conductors conduct us, our directors direct us, the government governs us, police police us and our bosses boss us. Life is full and busy and challenging and fun and wild and surprising and exciting and our calendars are crazy. Sometimes we wonder, "Who's in control?" Perhaps it’s Siri or Alexa or Google. As a teenager, is it possible to feel more in control? Agency. Agency. Agency, agency, agency. Have you ever said a word so many times it starts to sound weird? It starts to lose its meaning? Agency. Agency. When I hear this word “agency,” I tend to think of things such as insurance agency or a modeling agency. Or, of course, the CIA: America's Central Intelligence Agency. 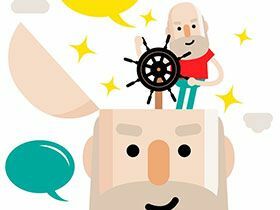 Have you ever had anyone, for example, a teacher, parent, coach or someone else you look up to, tell you that you should really start developing your own sense of agency? What are they talking about? What does that mean? Are you supposed to start your own modeling agency? Or join the CIA? Of course, if you did that, you wouldn't be able to tell any of us. No, nope, not that, none of those. That's not what I mean. 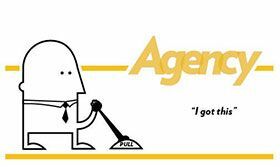 That's not the type of “agency” I want to talk about. When someone tells you it's time to start developing your own sense of agency, it means to understand the importance of free will, a uniquely human experience. True empowerment. Of being in control of your own life, decisions, actions and, sometimes, the consequences of those actions. Here's a question for you: do you have an internal or external locus of control? Do you feel like you’re in control of the things that happen in your life? Or do you feel like someone else is in control and instead it’s more like all these things happen to you? Studies show that human beings have a tendency to attribute their failures to external forces and their successes to internal forces. To be frank, teenagers can be experts at this. When things don't go well for teens, it’s understandably natural for them to believe the reasons are beyond their control, that they’re external and not their fault. And, when things do go amazingly, the reasons are increasingly internal. For example, what do you tend to say when you bomb a test? "Oh, that test was totally brutal. There were questions that we'd never even seen before. Nobody did well. It was too long. It was too difficult. The teacher didn't teach us; we weren't prepared well enough. The room was too hot, too cold, too small, too big . . . .” These are all EXTERNAL reasons for why you bombed the test. Ah, but when you totally aced that test it's because you studied hard, you're a smart cookie, you know your stuff, you're simply awesome. And, to be perfectly honest, we teachers are totally guilty of this, too. If the class results on a test that we just finished marking were low, the first thing in our mind is, "Those dang kids, they totally didn't study hard enough. They're not paying attention during lessons, they aren't making my class a priority, they probably spent the night gaming or gabbing online again instead of preparing." All external reasons. But, if the class results on a test that we just finished marking were high, we're patting ourselves on the back and taking full credit for the success. "Hey, get a load of me: teacher of the year right here. I think I'll head to the staff room, where I’ll treat myself to another cappuccino and drink it out of Ms. Boland's World's Best Teacher coffee mug.” Thus attributing success to internal reasons. But, when we win it’s different. "We played our system and were totally clicking. I was on fire—you shoulda seen me!" To shift toward having an INTERNAL locus of control from an EXTERNAL one requires us to develop our sense of agency. In September, Mr. Matthews encouraged us all to be empowered this year. It is indeed time to develop your ability to take action, be effective, influence your own life, and assume responsibility for your behaviour. This sense of agency is essential for you to feel in control of your life, to believe in your capacity to influence your own thoughts and behaviours, and to have faith in your ability to handle a wide range of tasks or situations. Have your own thoughts, make plans, carry out your actions. Participate in decisions that affect you. It’s really up to you. When things don't go your way or turn out how you expected them to, by having a well-developed sense of agency, you have more control over how you respond, react, overcome adversity, pick yourself up, dust yourself off, put your smile back on your beautiful face and get back in the game! You’re a teenager now. It’s your time to start taking control.